‘Belgravia’ is a modern pocketfold design that oozes style and elegance. 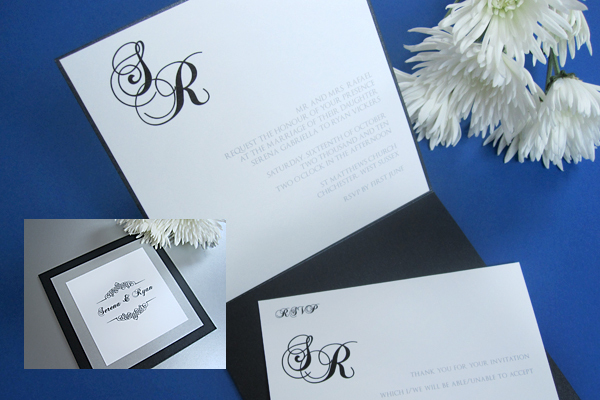 The standard pocketfold wedding invitation shown here is metallic black 5x5in, supplied with unlined envelopes in white or ivory. The pocketfold is also available in DL (100x210mm) or 5x7in (128x178mm) size. Add RSVP, or insert cards with gift list, directions or accommodation information for your guests. It is also available in a flat style, with 2 card layers, if you do not require a pocketfold.